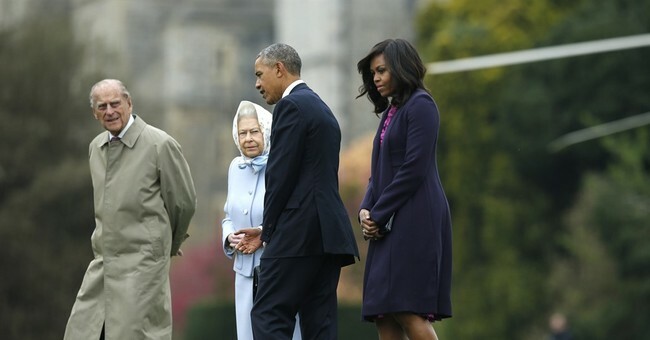 WINDSOR, United Kingdom - The Queen banned Obama from landing a dozen helicopters at Windsor Castle because last time he visited six of them ruined the lawn. The 90-year-old monarch is said to have told aides the helicopters were ‘over the top’ and they would be limited to three. US Secret Service claimed it needed all twelve so agents could be in close proximity to the President when he came to the castle on Friday. The service also demanded to post guards inside the private dinner with the Queen and Obama, presumably to prevent the pensioner attacking the President. Commenting on the three helicopter limit an insider told the Daily Star newspaper: “Various US aides said that wouldn’t be possible. The President has a small army of Secret Service agents who follow him all over. “They said they needed to be within reach of the President at all times. They also wanted guards posted inside the dining hall when he had lunch with the Queen. But Her Majesty refused to back down and said, ‘three helicopters only’. During the Obama State Visit of 2011 the heat generated by the helicopters destroyed one of the oldest lawns at the 900 year old castle. The Queen was said to be “not amused” by having to fix the "write off". The castle is so important the Queen's grandfather, King George V, changed the name of the dynasty from the House of Saxe-Coburg and Gotha to the House of Windsor in 1917. The Queen and the Duke of Edinburgh are spending more of their time in Windsor as they get older. The Duke is the head ranger of Windsor Great Park, a job he is said to take very seriously. Despite not being allowed to bring in all his helicopters London airspace was closed to private planes during Obama’s visit. Several US F-22 Raptor combat jets were also on standby to neutralize any potential threat. President Obama is now in Germany, where he faced protests about his policies towards the EU. He had already caused outrage in the UK by threatening to cut economic ties with Britain if the country votes to leave the EU in June. This is expected to be his final visit to Europe before he leaves office.